I've put it off as long as I can. I've endured teasing from co-workers, friends and even strangers because my phone is so old. I have had this phone since 2000 and it still works great. I've never needed a new battery. It can't do a lot of the things the new phones can do but it can make phone calls and that's what I need it to do. But now I think it might be time to finally get a new phone. 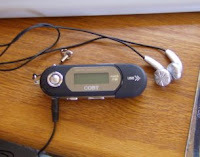 Today my mp3 player broke. If you remember, this was the mp3 player I got free from a co-worker a few months back. I loved it. It made work so much better. I actually looked forward to getting to my desk and listening to my new songs. Today I came back from lunch and the poor thing just blinked at me. I tried to torture it back to life by dropping it on the floor but it didn't work. I looked up mp3 players on ebay...yikes, there are a lot to choose from. Then one of the guys mentioned that the new cell phone he was getting has a music player in it. Hmmm. I have the Verizon new-every-two plan so I have had a $100 phone credit for years. I didn't want to get a new phone before because the web site said I had to upgrade my phone plan if I did and the new plans don't start their night minutes until 9pm instead of 8pm. That makes a big difference to me. I can ask people to wait until 8pm to call but 9pm is just too late. Now the site said that I only have to upgrade my phone plan if I get certain phones. I looked at the approved phones for my plan and there are quite a few with music players. I will still need to buy a case for my new phone and a car charger. Hopefully my hands-free headphone will still work. The case and charger will probably cost less or equal to what an mp3 player would cost. Now the hard part...picking the right phone. I need to make a decision quickly...I miss my music!